Note: Map colors above are determined by the operation of at least one natural gas or electric utility under the specified rate type. Other utilities in the same State may, but do not necessarily, operate under similar programs. Rate adjustments for variations in demand due to weather only are not included. Under traditional natural gas and electric utility regulatory models that tie a utility's profits to its sales volume, successful energy efficiency or conservation programs (e.g., demand response or a cash-for-clunkers rebate on appliances) reduce utility profits. 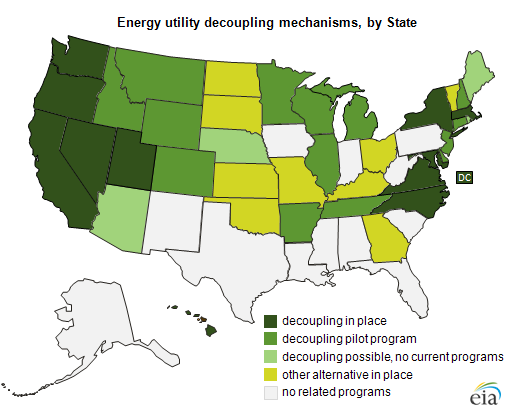 State utility regulators use decoupling mechanisms to improve the utility's incentive for efficiency and conservation efforts by decoupling a utility's allowed profits from its sales. Alternatively, regulators can incorporate a lost revenue adjustment into the utility's rates, adding in the revenue lost due to avoided sales as a result of increased efficiencies, or regulators can separate the recovery of a utility's fixed and variable costs. The map shows that many States have or are considering such programs. A State is colored in the map above if at least one natural gas or electric utility has a decoupled or alternative rate in place. However, since each utility's ratemaking is treated separately, one utility may be decoupled, while other utilities in the same State may not be. As discussed in a future article, more States have decoupling in place for natural gas than for electricity. Utilities must file with their state regulator to change their rates, meaning it could take years for a single utility to put a decoupled rate in place. The large number of pilot programs represents a significant expansion of interest in decoupling-type programs (see the decoupling Frequently Asked Questions from the National Association of Regulatory Utility Commissioners for a 2007 version of this map). Pilot programs typically run three or four years. In some States, there is a legislative or regulatory provision for decoupling, however no decoupled rates are currently in place for utilities in that State (e.g., Maine). Other States (e.g. Florida), have various annual or monthly adjustment clauses that may preclude the need for decoupling. Decoupling and alternative programs are often a complement to a renewable portfolio standard that includes energy efficiency, or an energy efficiency resource standard requiring utilities to reduce electricity or natural gas demand. While decoupling and alternative programs do not require utilities to develop or market energy efficiency programs for their customers, they do remove the disincentive for utilities to pursue those types of programs. The American Council for an Energy-Efficient Economy collects details on each State's approach, including incentive programs.